Born in Melbourne in 1926, Fay Marles was educated at Ruyton Girls' School. She was an undergraduate at the University of Melbourne between 1944 and 1948, completing a combined course of Bachelor of Arts and Diploma of Social Studies, and worked in social welfare at the Commonwealth Social Services Department until her marriage in 1951. After having four children, she returned to study as a mature-aged student and in 1975 was awarded her Master of Arts. After two years as senior tutor, then lecturer in Social Work at the University of Melbourne, and with a deep interest in workforce equity, she became Victoria's first Commissioner for Equal Opportunity, an office she held for the next ten years. 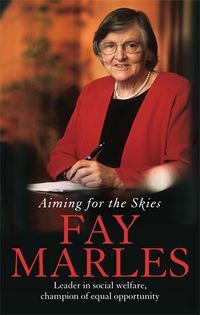 Fay Marles served on the boards of many institutions and in 1986 became a Member of the Order of Australia in recognition of her public service, particularly in the field of social welfare. The following year she established a management consultancy firm specialising in equal opportunity, workplace dispute resolution and program planning and review. After serving as Deputy Chancellor of the University of Melbourne for fourteen years, and having demonstrated great commitment to Indigenous, multicultural, student and staff issues, Fay Marles was installed as the first female chancellor of the university in its 150-year history. She is now retired and lives in Melbourne with her husband Don.